Looking For An Easy Way to Earn Extra Income? You'll Earn A 10% Commission For Every Customer You Refer. If you're looking for a quick and easy way to earn passive income, the $99 Social Affiliate Program is for you. The $99 Social Affiliate Program lets you earn recurring monthly commissions for every customer you refer to the program. It's a "set it and forget it" way to generate passive income month after month. Keep reading to learn more, and to see for yourself how easy it is to start earning with the $99 Social Affiliate Program! You receive a generous commission. Not only do you get a commission when your referral purchases, you'll get the same commission every month they renew their account. And it gets even better: Thanks to automatic billing and how well we take care of our clients, our retention rate is very high. Don't be surprised if a single sale pays you for many months to come. We use a 90-day cookie. When someone you refer to our site purchases anytime within 90 days of your referral, you'll get the commission on that sale! We pay out monthly – with a low minimum payout. Passive income is the best kind of income. You'll be earning commissions while you sleep, build your business, spend time with your family, or enjoy your favorite hobby – any time night or day! As soon as you sign up for the $99 Social Affiliate Program, you'll receive a unique affiliate ID and access to your Affiliate Dashboard where you'll find links that contain a special tracking code. Then, simply link your website to ours. 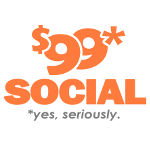 When someone clicks on your link to sign-up for $99 Social's services, you'll earn a $10 commission on their purchase. It's that easy! And like you read above, you'll keep getting paid a commission as long as they keep paying for their plan. Our affiliate software records all transactions from your site in real time – all impressions, links, and sales are tracked instantly. Just hop into your Affiliate Dashboard to see which of your links and banners are performing best. Your Affiliate Dashboard makes it an absolute breeze to optimize your site for maximum sales! Sign up to join the $99 Social Affiliate Program by clicking the orange "Get Started" button below. Link to $99 Social's website from your website, blog, or even social media sites, using your unique affiliate links. Earn a 10% commission from all qualified sales that come to us from your affiliate links. Continue to earn as long as your referrals stay with $99 Social! Sit back and enjoy recurring monthly passive income.